What if what we thought, and held most dear, about the foundations of myth and history was wrong? This work explores Norse mythology linked to ancient Mesopotamia and rattles current interpretations and beliefs. Here the initial specifications of a common, historical and mythological based, ancient pantheon is presented through the merging of popular ancient myths and religions with contemporary historical research. This merging of myth through the utilization of etymology, phonology, the genealogical record, the historical record, and regional landmarks, attempts to construct a common story in theme, from which it is hypothesized to represent actual historical events, places, things and people. Initial evidence is presented to aide in constructing a common source of supposedly independent ancient stories. 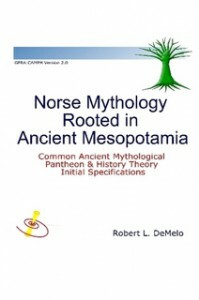 The central premise of this work starts with the hypothesis that Norse mythology is directly connected to ancient Assyria. It is suggested that Norse mythology is a highly preserved generational translation of people and places that actually existed. With a fairly high level of confidence, the primary nine worlds of Norse mythology are believed to have been found in and around the ancient Middle East. Was Thor real? Yes I believe he was very real. Vikings: The Lost Ancient Assyrian Expedition? Were the Norse Gods Real?